I started in 2003 so that makes it 9 years. 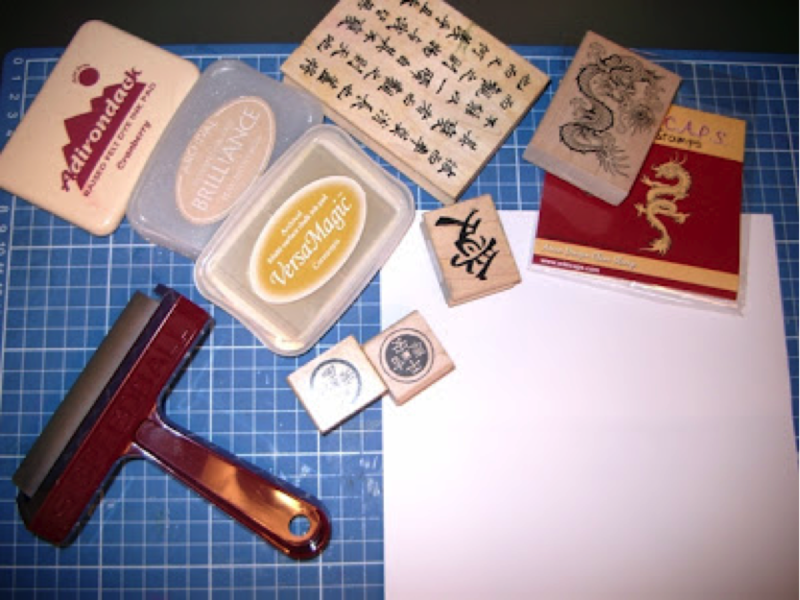 I went to a Craft Expo in Australia and there were paper craft and Rubber Stamping Classes available. As soon as I saw the possibilities I was hooked. I love to play with inks. So distress is one technique I have tried quite a lot. Also brayering and layering with ink. I want to explore masking more and stamping off the page. I bought a lot from Judikins, Stampin’ Up!, and All Night Media when I was first starting out. Now when I shop for stamps I tend to focus more on what is available and whether I like the stamp’s image or sentiment rather than who it is by. ArtNeko, Hanko, and Mariandme. 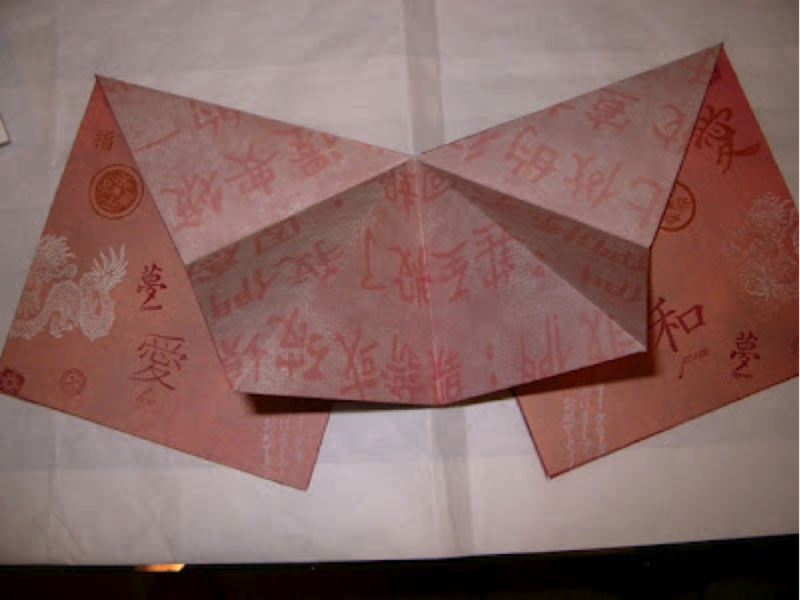 I like fans, geishas, Calligraphy and my favorite, of all, is the Haiku Bunny. My heat gun, stamp positioner when appropriate, and rubber brayer for backgrounds. I also like to use the dusting powder prior to inking when I emboss. Many times it is a quote or message. If a card seems unfinished or needing a little something more, I set it aside and wait for the idea to come to me. It usually does. I like the use of natural objects like feathers, seeds and tiny shells. I do love my Cuttlebug. I seem to be hooked on dimension. I also depend on my paper cutter, Scor-Pal and the use of curved tweezers for handling smaller items. Don’t be afraid to experiment with new techniques. I even keep pieces that don’t seem successful and have used them in totally unrelated projects to great effect. I also keep my scrap papers organized in clear bags by color. It is amazing how may times I can draw from them, rather than cutting into a new sheet of paper when a small piece will do it. Being a resident of Hawaii there is a large Oriental influence from Chinese, Japanese and Korean people. It seems I have always been drawn to the exotic differences in food, clothing, dance and the symbols, images and poetry of the East. There is a store in Bettendorf, Iowa, USA called Addicted to Rubber Stamps that claims to have 1 million rubber stamps. Perhaps that is the place to go!!! Split Coast Stampers, WorldofCrafters, and CircleofCrafters. I am also in some Teabag Folding Yahoo Groups. Locally I have a small group of friends with all levels of experience and we take turns in teaching a new project to each other weekly. I am not a subscriber to any at present but like the Stampington publications, Stampers Sampler and Take Ten. I also find VSN at our local Stamping shop. Lately I have been in the tips featured in VSN, however I haven’t submitted work to any other publications. Perhaps after being recognized here it will be something to consider. I go to Jazzercise 3 times weekly to stay fit but can only do low impact now. I took piano lessons for 2 years and mean to practice more. I dabble as a writer-mostly poetry and have a website for it: http://pixordia.pages.qpg.com/ I enjoy the usual wifely joys of baking, gardening and also like to read. I used to ride and handle horses when we lived on a property in Australia. We also used to go on ski trips to Tahoe, Taos and Colorado. I could manage and enjoy more strenuous activities when I was younger. Now I enjoy all aspects of paper crafting, especially collage, oriental designs, and over the years I have tried Quilling, Iris Folding, Teabag Folding and ATC’s. I started out as a Guild teacher for Floralpunchcraft. Nature has a big influence on me. Many of my stamps and punches are leaves. I like challenges but it is usually an image or a quote or an occasion that I create for. The internet is a huge source of inspiration and interacting with other papercrafters. For ideas it’s always wonderful. I have tried the usual, unusual things with great expectations LOL – bleach, or shaving cream to marble paper, and metal cleaner to strip glossy magazine pages to alter them. I like the uncertainty of the results and the happy surprise that comes when they turn out well. I tend to walk along looking at the ground or in the sand for any unusual shaped, stick, rock or shell to save and use later as embellishments on the right project. And last but not least youtube.com is an endless source of tutorial videos. I am an Australian, born in Tasmania and married to a Queenslander. I trained as a Nurse in the Queensland Regional Training Scheme travelling from country to city hospitals to gain experience. I am a Naturalized US Citizen and live in the 50th State. We recently celebrated Admissions Day here in Hawaii. I have been married for 40 years and since we were never blessed with children we have a fur baby, a dear Maltese named Kea. Our garden is an oasis where we enjoy spending time in the outdoors. We love travelling, sometimes to the US Mainland, and we used to travel regularly back to Australia. Our favorite destination now would be Ireland, on a Viking cruise on the rivers of Europe, or the Mediterranean Sea. Inks: Versamark Clear, VersaMagic Cornucopia, Brilliance Pearlescent Beige, AdirondackDye inks, Cranberry and Caramel, Stampin’ Up Whisper White. 2 sheets, more of co-ordinating scrapbook paper. or you can use matching papers from any source. Cut as described in steps below. 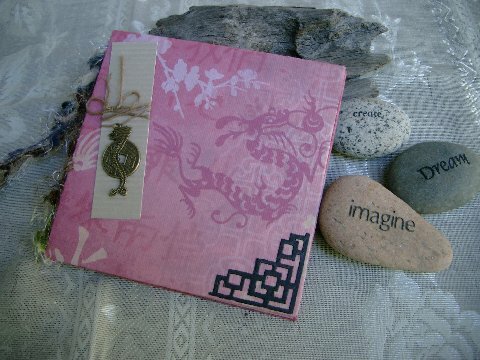 2- 6½” square pieces with a motif or feature for the covers. I featured dragons from the print for mine. 2X 6″ squares plain paper or cardstock for inside covers. 1X 8″ square with print on one side and plain on the back side for fan pop-out. 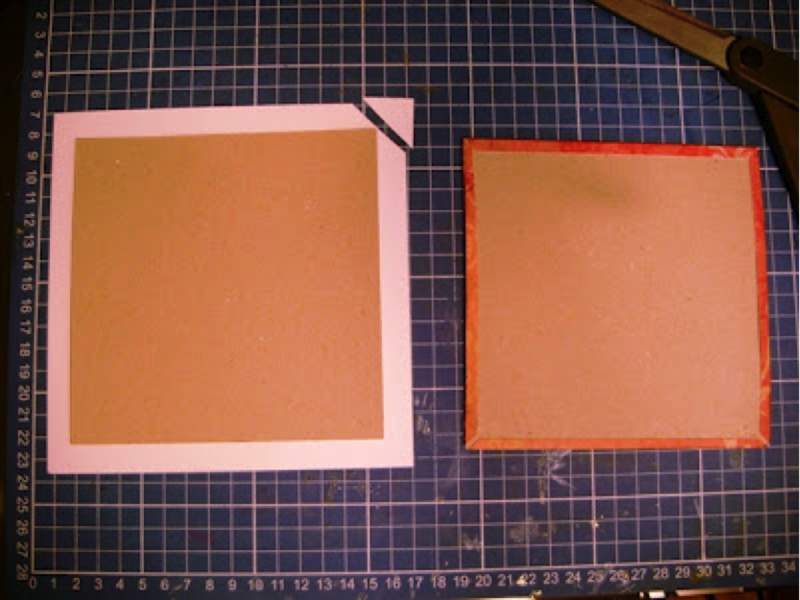 Glue the cardboard onto the 6½” front and back cover pieces, leaving an even margin around them. I use Fabritac glue as it gives more room for re-positioning and it dries clear and will not buckle the paper. Trim across the corners (as shown) and fold in the edges. Cover the inside and hide the edges with the 6″ sq. plainer matching paper or cardstock. Book covers finished. Set aside for now. Now the fun part of decorating the fan-fold. 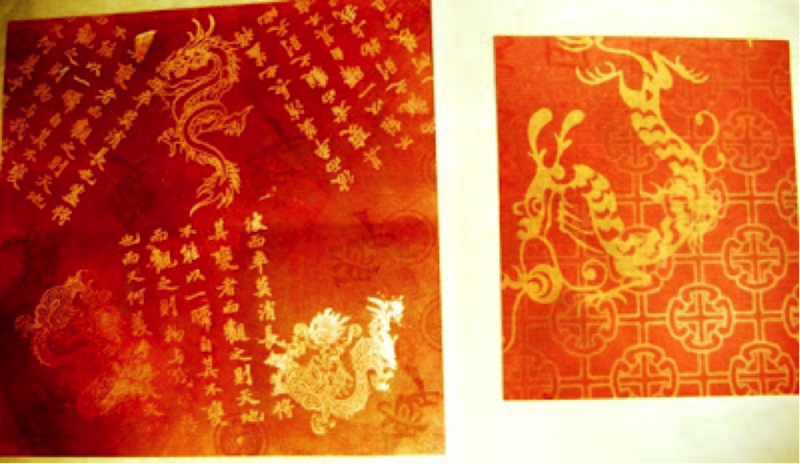 On the white side of the 8″ piece of co-ordinating paper, stamp your theme ( I used dragons, calligraphy and oriental coin stamps) in Versamark ink and emboss with clear powder for the images you wish to appear as distressed . Stamp calligraphy and coins in Caramel and Cranberry. 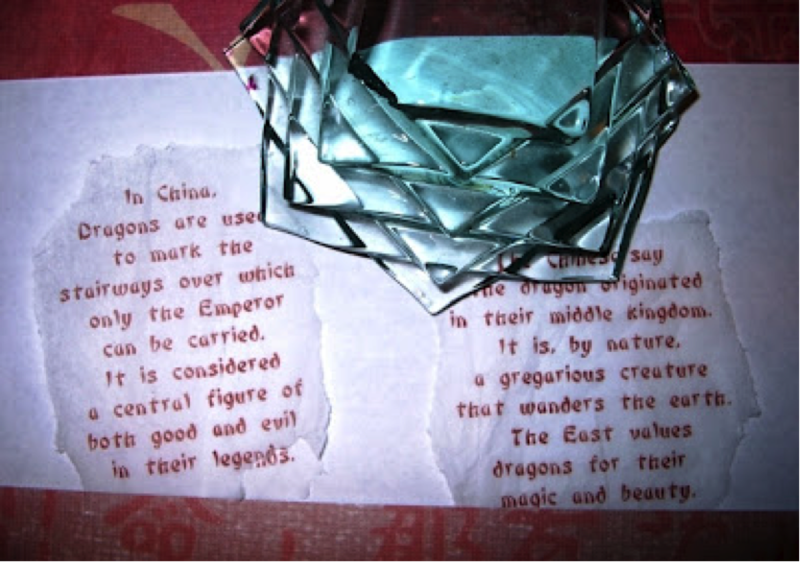 You can add more dragons in a white ink, if desired. 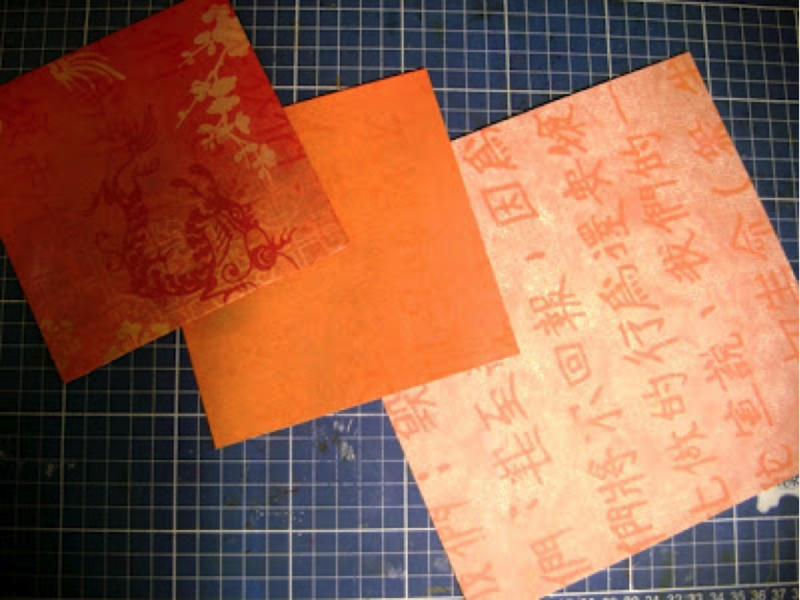 For brayering the background, choose inks that will match your paper as closely as possible. I chosen dye inks, Cornucopia, Cranberry and Caramel and gave a final coat of Brilliance Pearlescent Beige. 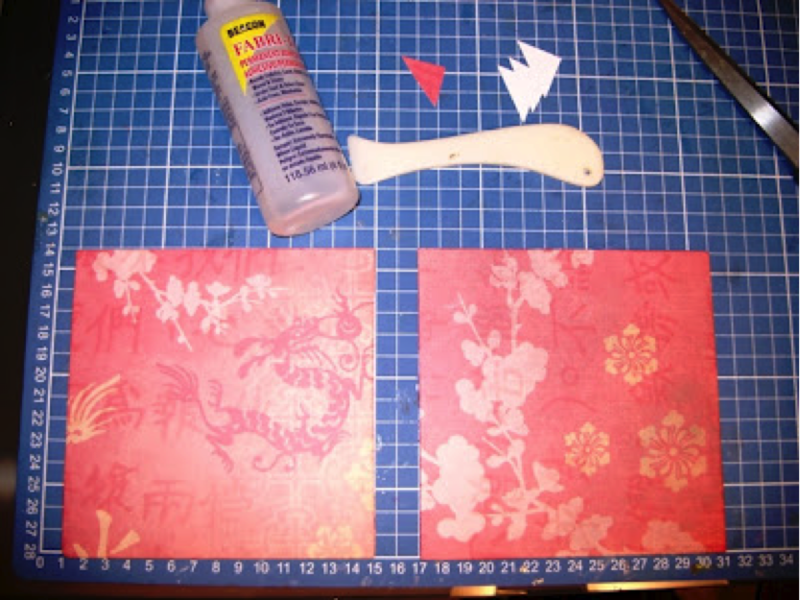 My brayered and stamped piece is on the left and the design paper I matched is on the right. Orient the design so that it appears right side up when the fan unfolds and slit to the center on line indicated. 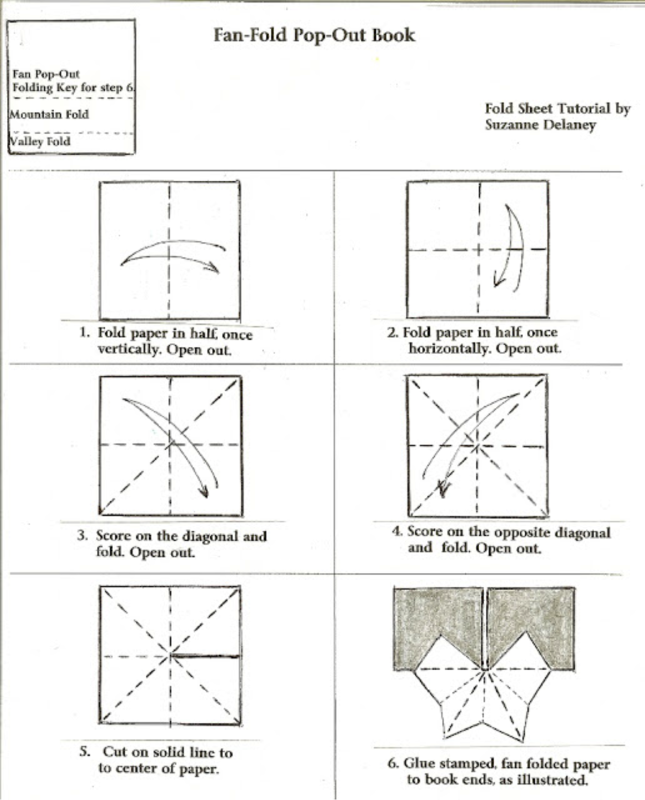 Fold, valley, mountain until it forms a small triangle. Attach front and back covers evenly as per fold sheet. 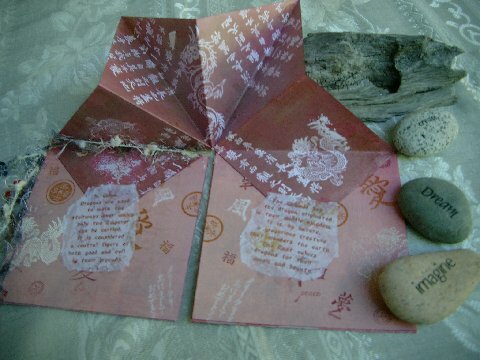 Embellish with quotes printed on tissue and torn, or stamped quotes. Tie yarns around with beads attached and embellish with crimped cardboard, fiber and a brass coin or figure. on my blog…I would love to see them. congratulations, Suzanne. You definitely deserve this honor. Great project. Enjoy your month as SAM…your project is wonderful!!! Enjoyed reading your bio! Congratulations Suzanne! 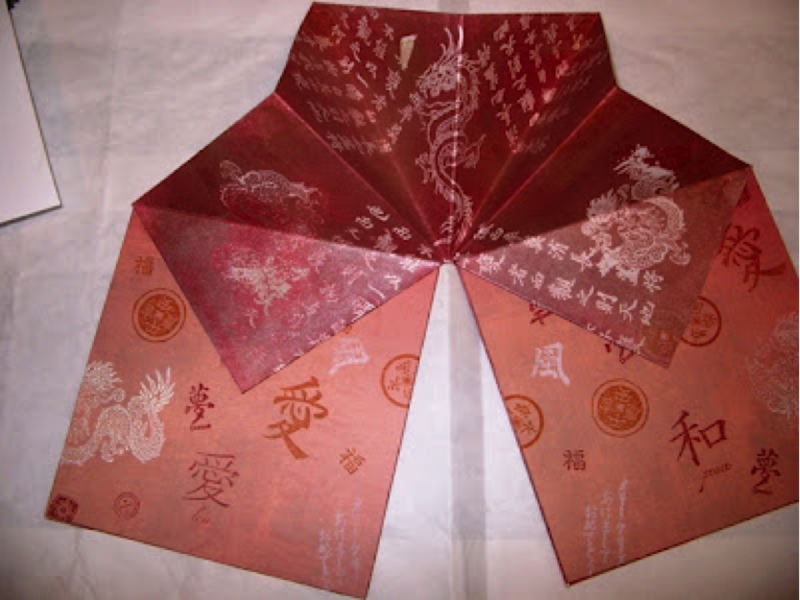 Love the fan fold book, will have to create one soon. Many congratulations Suz! I loved reading your bio – very intersting! Your project is both unusual and gorgeous! Thank you for the instructions. Enjoy your month as SAM! I feel so honored and so glad you like my project/ tutorial. Congratulations Suzanne – it’s lovely to learn a bit about you and your project looks fun, one I will definitely try. Congratulations, Suzanne. I’m a little late posting my comments but they are sincere and I love your fold-out book project. It looks so elegant. I loved reading your bio and your demo is great. Wow! that project is awesome. I’m not sure I am skilled enough to try it even though your directions are superb! Want to come to the United States and teach? Congratulations on being Sam Susanne! I loved reading about you and your creating career. It seems we all have so much in common. I too like to walk along slowly outside to see what treasures that I might find to include in projects. Your book is beautiful and thank you for sharing the tutorial to make it. Your techniques and designs are beautiful. Thank you for your inspirational links, always looking for new ideas. Beautifully balanced colour and embellishments. Well done, Suzanne. Congratulations. Lovely project and I liked learning more about you in the bio. Happy to see you back with us. Congrats to you! Love your project and may have to try it very soon! You have a great life being able to have traveled so much. Congratulations Suzanne!! Beautiful unique project!! Love fancy fold things so will have to try this!! Thanks for including the tutorial!! Contratulations to you Suzanne for being chozen SAM this month! Your project is very creative and I loved reading about you. Congratulations on being the SAM for October! Your project is gorgeous, and the directions are so clearly laid out.